Keeping your furry family members safe during the holidays can be a difficult task. There are the ornaments, plants, presents, lights — oh, and who could forget the Christmas tree (if do you decide to put one up this year)? Let’s take a look at some simple steps that will allow your pets to join in the holiday fun this year while avoiding any trips to the animal emergency room. Place your Christmas tree in a corner, blocked off from your pet’s wanting eyes. If this doesn’t keep your dog or cat from attempting to jump onto the tree, you can place aluminum foil, a plastic drink bottle filled with knick-knacks, or anything else that creates noise on the tree’s bottom limbs to warn you of an impending tree disaster. Do not put lights on the tree’s lower branches. 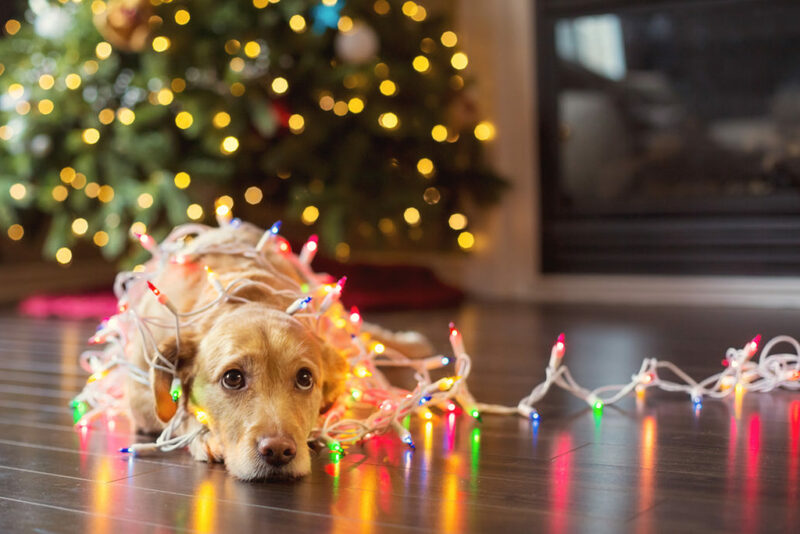 Not only can your pet get tangled up in the lights, they are a burning hazard. Additionally, your dog or cat may inadvertently get shocked by biting through the wire. Ornaments need to be kept out of reach, too. In addition to being a choking and intestinal blockage hazard, shards from broken ornaments may injure paws, mouths, or other parts of your pet’s body. For those buying a live Christmas trees this year, keep the area free and clear of pine needles. While they may not seem dangerous, the needles can puncture your pet’s intestines if ingested. Did you know holly, mistletoe, and poinsettia plants are poisonous to dogs or cats? If you normally use these plants to decorate your home, they should be kept in an area your pet cannot reach. Edible tree decorations — whether they be ornaments, or cranberry or popcorn strings — are like time bombs waiting to happen. These goodies are just too enticing and your pet will surely tug at them, knocking down your wonderfully decorated spruce. To prevent any accidental electrocutions, any exposed indoor or outdoor wires should be taped to the wall or the sides of the house.